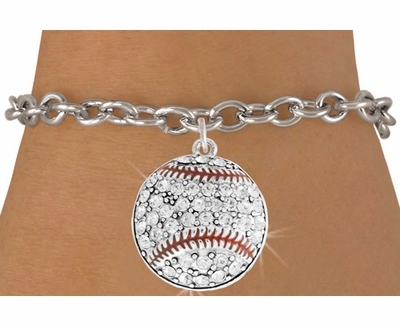 Fashionable Baseball / Softball Charm Bracelets with Clear Crystal Gemstones - Softball & Baseball Jewelry, etc. These very Stylish & Bright Crystal Gem Rhinestone Baseball * BLING * Charm Bracelets feature a large fashionable Baseball / Softball design Pewter Charm with LOTS of bright & shiny Crystal Gemstones, on a 8" long adjustable Silver Link Chain with Toggle Clasp. The Crystal Baseball Charm pendant measures about 1" Diameter. Add this nice White Padded Gift Box to your order for any Jewelry item, or other small Gift purchases. Gift Box measures 3.5" x 3.5" x 1" deep, with White Cotton Padding on the inside. » Volleyball Jewelry, Keychains, Medals, etc. » Softball & Baseball Jewelry, etc.